Lions are commonly known as ‘kings of the jungle’. People around the world consider the symbol of lions as the sign of strength and power. They are the world’s second largest cat after the tigers. They are the social cats and live together in groups called pride. Lions are the mammals. They grow about 5 to 6 feet long from its head to the back and can weigh as much as 130 kg (400 pounds). They have four legs with very powerful paws. They have very good eyesight, sense of smell, and sense of hearing, which make them incredible hunters. 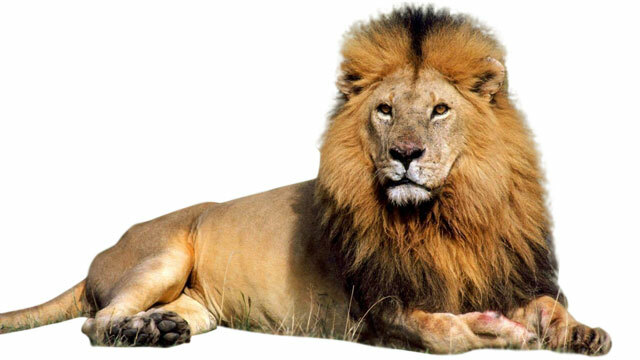 The male lions have a nice mane (hairs around the neck), whereas female lions don’t have the mane. Lions are carnivores (meat eater). They mostly eat buffaloes, zebras, and wildebeest. They are very good hunters, and often hunt in groups. The prey is mostly hunted by the female lions. Lions together with their group can hunt down elephants and giraffes. They spend about 20 hours in resting and sleeping and hunt during dusk and dawn periods. The majority of the lions are found in the India and Africa. They mostly live together in groups called pride. Each pride contains about 3 to 30 lions. Pride is the mixture of the males, females, and cubs (baby lions). The cubs of the lions live with their family until they become 2.5 to 3 years old, then they are driven out of the pride. Lions species are declared as vulnerable. African lions are red listed by IUCN and have been near the extinction. The number of lions has decreased due to the destruction of their habitats and forests. Many human hunters consider themselves as a brave man due to hunting a lion. The number of lions in India has reached to 500. The roar of the lions can be heard 5 miles away. In the wild, lions can live about 15 years. Lions can reach the speed of 81 Km/h (50 miles/hour), but not for too long! They need to reach the target close enough to get successful hunt. Abdul Wahab, "Lion," in Science4Fun, April 13, 2019, http://science4fun.info/lion/.